The Branch Tramways and Sidings of the Severn and Wye Tramroad. The featured image shows stone being transported down the Bixslade Tramway, one of the feeder tramways to the Severn and Wye Tramroad. There were 12 branch tramroads off the Severn and Wye Tramroad. Many of these remained as feeder routes to the Severn and Wye Joint Railway in the 19th Century. The 12 include the Mirystock-Lydbrook-Bishopswood tramroad and the privately owned Oakwood and Dyke’s tramroad branches. In addition scores of sidings and short branches served particular mines, quarries and works. Traces of most of the branches remain, rarely being disturbed by the later railways. With the exception of the Churchway branch (and possibly Moseley Green), tram locomotives did not serve the branch lines, being too steep and torturous. Various proposals for converting the branches to railways met with little success and they were gradually superseded by adjacent railway routes or abandoned. Three branches however, Bixslade, Howlers Slade and Wimberry Slade, remained in use into the 20th century. Prior to the construction of the harbour, the tramroad ran down to Lydney Pill by a temporary railroad. Once the outer harbour was completed in 1821, the tramroad was extended along the north side of the canal and a branch which ran across to a new wharf on the west side of the harbour was added in 1823. SO632021 – A short branch to the Lower Forge, connecting to a private tramroad was made in 1818. A plan of 1852 shows that siding from the Severn and Wye tramroad connecting to a private tramroad at Lower Forge. SO630037 & SO625048 – In 1814, connections were made to Upper and Middle Forges. Birches Branch – SO629082-SO632087-SO633093 is also partially covered in the above blog. It left the main line south of Parkend and passed through Oakenhill Inclosure to Birches Well, Independent, and other coal pits. In 1835 the branch terminated at Newman’s Shropshire coal pit, and a map of 1842 shows it joining the Kidnalls Mill branch. In 1844 the Severn and Wye Co. agreed that the Park End Coal Co. could use the tram plates from the engine to the Kidnall’s Mill branch and by c.1849 the branch was disused. Abandonment was approved in 1874 and the remainder of the track removed by 1877. The Birches branch can be traced where it crosses the Parkend-Yorkley road as a broad path and can also be picked up on Moseley Green behind the Rising Sun Inn, and where it crossed the Parkend-Blakeney road. The map in my blog (https://rogerfarnworth.wordpress.com/2017/09/27/moseley-green-tramways) shows the approximate position of these locations. Milkwall or Darkhill branch – SO617077 – SO607081 – SO599083 – SO588088 – SO585092 – SO583083. The branch brought iron ore from the Milkwall area to Parkend, served collieries and wandered through large quarries. It was under construction in 1812 and followed a hard torturous hillside route. In 1814, a request was made that the branch to Darkhill be extended to meet a branch of the Monmouth Tramroad, an interchange wharf was established near Winnall’s Deep Level. This connection was soon allowed to fall derelict. Some of the worst curves on the branch were being smoothed out in 1860. The tramroad was in operation until the railway was built, as a short curved tunnel ran under the railway into Point Quarry and a temporary wooden bridge was made at Milkwall. When the Coleford Railway replaced the tramroad branch, a section from Milkwall to Sling was left in place with a transhipment wharf at Milkwall, conversion of this section began in 1875. In 1995 the branch was still visible as a level track serving several properties. At the time, pipeline works exposed the old cinder trackbed and what appeared to be two iron fishplates were observed in the excavated spoil (these were photographed but not retained). The course of the tramway is visible as an earthwork on aerial photographs. It leads across the northern part of the Darkhill ironworks site from a junction with the main tramway to the east. Its western end appears to lead towards the Titanic Steel and Iron works, while possible branches to the north lead towards an area of coal mining and quarrying. Records also note that the tramway is visible on aerial photographs at SO 5839 0837. The line leads from Milkwall to the Ham, British and Sling ironstone mines. The route of this line branches in several places, the longest extent being 1770m. It appears on photographs as a trackway or road, without any sign of remaining rails. Ivy Moorhead branch SO617078 – SO619081 – SO621081. The Ivy Moorhead branch was built without authority, as the Severn and Wye Co later sought a licence in 1813 to legalize the branch. It relinquished that licence in 1828. The line had been taken up and re-aligned by the Park End Coal Co. in 1821 to carrying coal to the ironworks. However, the branch became part of the Severn and Wye tramroad again in 1829. In 1835 it had torturous sidings to Parkend Main, Royal, Catch Can, Standfast and Staple pits. The furnaces of the Parkend Ironworks were served directly by a branch that ran over the main tramroad via a “covered way”. In 1877 the line still served the Royal pit (then Castlehill Colliery), but it had been removed by 1901. Brookhall Ditches branch SO614082 – SO619088. Estimates were sought for completing the 1/2 mile branch in 1811. In 1824 a request was made to replace the rails as the abandoned Brookhall Ditches works were re-opened by the Park End Coal Co. A licence was obtained in 1837 for an extension to Foxes Bridge, however the Kidnall’s Mill branch, opened in 1841, offered a more direct outlet, avoiding the busy Parkend area. A licence of 1843 authorised an extension to the Kidnall’s Mill branch to Foxes Bridge, however it is unlikely that it was completed, as the Foxes Bridge Pit in question never opened. In 1868 the Park End Coal Co. had erected a platform across the Brookhall Ditches branch and abandonment was authorised in 1874, the plates being removed by 1878. Bixslade Branch – SO608099 – SO597105. The Bixslade branch was completed in 1812 and left the main line on an embankment against which a dam was made by the Forest of Dean Iron Co. in 1825 to create the Cannop Ponds. By 1841 the branch served 3 collieries in addition to the Bixhead quarries. Several licences were granted in the 1890s for extensions around the Bixhead quarries. The line was still in regular use in 1946 by a coal pit near Bixhead, although the last load of stone was brought down the line in 1944. By 1947 lorries carrying stone on the upper section had severely damaged the track, although sections were preserved round Bixhead Quarry and at the other end from the Bixslade stoneworks to the railway wharf. From a point near Bixslade Land Level, the lorries took a more convenient course and the track was in good order until it was lifted in 1952. Substantial track remained, largely buried, on the wharf in 1961. 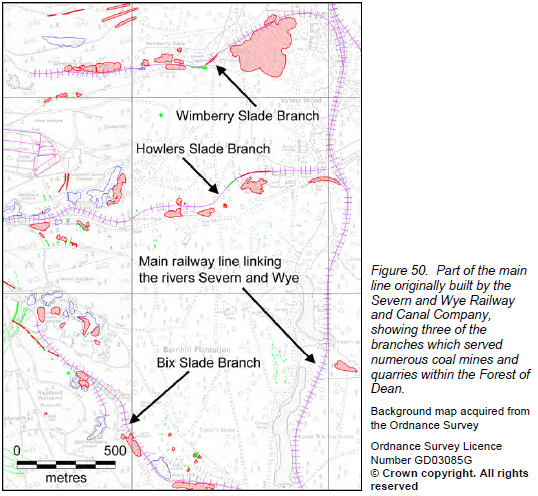 The branch was owned and maintained by the Severn and Wye Co. to just short of the quarries. The lines within the quarries were provided by the traders although often the S&W provided the tramplates. The Bixslade branch is marked on the 1834-5 and 1859 West Dean tithe maps. It is also visible as earthworks on aerial photographs. The route extends for 800m between SO 5925 1095 and SO 6000 1025, to the south-west of Bixhead Quarries and continues on to map sheet SO 61 SW. An extension to Spion Kop Quarry is situated at SO 5983 1048 and measures 226m long. Linear earthwork banks define a probable extension of 500m westwards, between SO 5922 1093 and SO 5963 1068, possibly to meet the Darkhill branch of the Monmouth Tramroad. The line was extended for short distances from time to time as the quarries developed, the Severn and Wye generally supplying the plates and the owners doing the rest. There is a very enjoyable short walk or noted by the Forest of Dean Local History Society, as shown on the map here. Howler’s Slade branch – SO610114 – SO593113. The Howler’s Slade branch ran parallel to but above the Speech House to Coleford road for most of its 1 mile course and was begun in 1811. In addition to various pits and quarries, the branch also served a chemical works at Cannop Bridge and a foundry. The branch fell derelict c.1920 but the track was not removed until 1941. From its crossing of the B4226 at SO610166, its course can be traced, crossing Cannop brook by a bridge with a cast iron railing, past the remains of the chemical works and then over the B4234 Cannop-Lydbrook road immediately north. The tramroad is visible as earthworks on aerial photographs. It leaves the main line at Cannop at SO 6108 1154 where it can be traced approximately westwards for 1080 metres to the edge of SO 61 SW but does continue further west terminating at SO 5936 1136. Much of this route is over level ground but an embankment is visible at SO 6070 1162 and can be traced for approximately 160 metres where it then meets a cutting which is 60 metres long and ends at SO 6048 1154. Wimberry Slade Branch – SO610121 – SO603121 – SO594121. A Parliamentary plan indicates a terminus near Wimberry Colliery, but the line was later extended to serve other pits, and was completed at the same time as the main line. A broad-gauge railway branch was laid over the first half-mile as far as Wimberry Colliery in 1868, however the tramroad branch continued in use. Abandonment of the branch line was authorised in 1874, however the western section continued in use, terminating on a wharf at Hopewell sidings. A succession of alterations were made to the tramroad over the years – with new sidings being laid as late as 1928. Part of the line was in occasional use in 1939, however in 1940, 14 chains were taken up for repairing the Bixslade branch. In 1943 the remaining 38 chains were damaged by military traffic along the line which was removed entirely in 1946. Traces of the tramway can be followed from where the railway bridge crosses the B4234. The Wimberrry Slade branch is marked on the tithe map and the 1st-3rd County Series OS maps. The western section of the route can be traced on aerial photographs. The tramroad extends for 520m in an east/west direction along a dry valley and continues to the east onto SO61SW. The western end terminates at Wimberry quarry and passes to the south of a shaft at SO 5984 1216, which were probably amongst the industries it served. Churchway Branch SO614146 – SO635153. The tramroad at Churchway was authorised to extend to the “engine pit” in 1810, however no connection was made to the Forest of Dean Tramroad and in 1814, the apparently useless rails were taken up at Churchway. In 1821 connections between the 2 tramroads were being repeatedly laid by an unnamed trader and in 1823 a licence for a connection was eventually given. The site of Mirystock tramroad junction has been obliterated by colliery sidings, originally the Churchway branch curved from the main line, however in 1847 a new curve was put in making a triangular junction. In 1865 following the opening out of the Mirystock tunnel into a cutting a new line was laid improving the access to the Churchway branch. Abandonment of the tramroad branch was authorised in 1877 and the tracks taken up almost immediately. The Severn and Wye Co built a branch from Mirystock to Churchway, where a junction was made with the Bullo Pill tramroad in 1812. A short loop line at Mirystock was constructed in 1847 to give better access to the Churchway branch from the south, a second spur to the Churchway branch was constructed in 1865. SO614146 – A siding, to a public coal wharf together with a weighing machine and cottage was sited alongside the Mitchledean-Monmouth road at Mirystock Junction. When the railway replaced the tramroad, this facility was duplicated c.250 yards to the south. SO614152 – Tramroad embankment over Greathough Brook. Lydbrook Incline, SO596168 is heavily overgrown but can be traced. The steep descent to the Wye at Lydbrook was an inclined plane controlled by ropes, little traffic used the northern part of the line and the incline was abandoned by 1856. Bishopswood Branch – SO597168 – SO60001680 – SO60281750. The Bishopswood branch of the Severn and Wye tramroad was completed in 1814 and had sidings to wharves near the Ruardean boundary, the branch was linked by an inclined plane with the forge on Lodgegrove Brook. The branch, the northern section of which was removed after the closure of the Bishopswood Ironworks, ran as far as the Ross road in 1833. It carried little traffic and the track was taken up in 1874. The course of the line to the road was visible in 1990. This was an extension from the original terminus at Lower Lydbrook, taking the line onwards to the Wye at Bishopswood. It was opened to serve the Bishopswood Ironworks. From the site of Lower Lydbrook station the trace can be followed as it curves towards Vention Lane, which it crosses below the Royal Spring Inn, and thence along a stone buttressed path across fields, eventually joining B4228 near the turning to Ruardean. Until c.1951 the route from Ventions Lane was used under toll for supplying Incline Cottages with coal drawn by horse-drawn carts. The sinuous course can be followed with ease until it joins the road where the 13th mile post (dated 1814) stood until 1952. Large stone blocks in the River Wye mark the site of the Bishopswood Wharf. The road to Nailbridge (1841) obliterated part of the Cinderhill route but the tunnel underneath road survives. 1. English Heritage’s Monument Protection Programme (MPP) Step 3 report. 2. Gloucestershire County Council Historic Record Archive which holds a great deal of source information. Monument No. 5701. 3. Fiona Small & Cathy Stoertz; The Forest of Dean Mapping Project, Gloucestershire: A report for the National Mapping Programme; English Heritage, National Monuments Record Centre, Great Western Village, Kemble Drive, Swindon, 2006. This entry was posted in Forest of Dean, Railways Blog on September 28, 2017 by rogerfarnworth.